President-elect Barack Obama stands with former Federal Reserve Chairman Paul Volcker, chairman-designate of the Economic Recovery Advisory Board, left, during a news conference in Chicago on Wednesday. As President-elect Barack Obama calls for big, bold economic ideas, it will fall to former Fed Chairman Paul Volcker to shoot down the unworkable and irresponsible ones. It’s the role of the heavy that Volcker will revive from the Carter and Reagan administrations. Back then, he was chairman of the Federal Reserve, fighting the necessary but politically unpopular fight against the inflation monster. Now, he’s head of Obama’s new economic recovery advisory board, where he’ll lead other policy heavyweights in overseeing Obama’s economic plans. 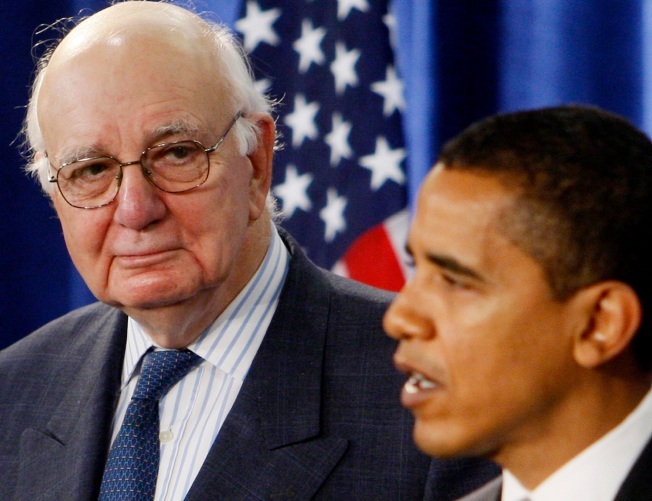 Those who know him and his career say Volcker will be the grownup at that advisory table, and not just because of his accumulated wisdom – at 81, he’s more than twice as old as the other member Obama announced Tuesday, Austan Goolsbee – but because of his economic thinking and character. Volcker is a giant in the economic world for breaking the back of double-digit inflation that gripped the American economy in the late 1970s. At the Fed helm, he made the tough decisions that politicians were unable, or unwilling, to make to get the problem under control. He dramatically tightened monetary policy – which drove short-term interest rates as high as 20 percent – and stuck to his anti-inflation guns despite backlash from many sides, including from liberals and Democrats in Congress. Volcker’s decisions were not easy ones. His actions touched off the worst recession since the Great Depression. There were unprecedented protests against the central bank. Fed officials were picketed and received two-by-fours in the mail with notes from workers in the hard-hit housing sector, saying “I can’t do anything with these, so you can keep them,” Reinhardt said. Volcker also had to withstand criticisms from politicians on Capitol Hill and in the White House under both Democrat Jimmy Carter and Republican Ronald Reagan. Through it all, Volcker was tough and resolute. “Volcker always said if you give me another better way I could have reestablished the Federal Reserve’s reputation as a kind of guardian of low inflation and overall price stability I would have taken it,” said University of California at Berkeley economist Brad DeLong. But in retrospect, no one has been able to pinpoint the “better” way the liberal critique of the day was calling for. “He is as serious and sober and reality-based as there is the world today,” said Kenneth Duberstein, a Reagan chief of staff. Volcker once and for all established the credibility of the. central bank as independent and committed to fighting inflation, which experts say set the standard for central banking around the world. While it was painful at the time, Volcker’s success set the stage for longer-term economic growth. Widely recognized for his deep understanding of financial markets, Volcker also dealt with an international debt crisis – elements of which are similar to the current crisis – that involved coordinating a rescue of overburdened emerging market countries with the American banks that made the loans. And while on paper his actions appear to have favored the interests of investing elite, Volcker in fact was motivated by “the welfare of the broad populace,” said Robert Bruner, dean of the Darden School of Business at the University of Virginia. Volcker recognized the destructive effects of inflation on the middle class, the elderly and the poor as it supplanted investment and employment, and eroded retirement savings and other safety nets, he said. Since retiring from the Fed, Volcker took on a role of an elder statesman rather than seeking ways to enhance his personal wealth, continuing what’s been a lifelong devotion to public service, according to colleagues. Among his public service commitments, he headed up the independent corruption investigation into the United Nations oil-for-food program with Saddam Hussein. He also served for a time as chairman of Wolfensohn & Co., an investment banking firm founded by the former president of the World Bank. He remained outside of politics, though, until he endorsed Democrat Obama in January, citing as his motivation “the breadth and depth of challenges that face our nation at home and abroad” and his belief that Obama could provide the needed leadership and new approach to face them. He became, as Obama himself said Wednesday, one of the president-elect’s “most trusted advisers.” And it appears Obama admires Volcker’s straightforward common sense as much as anything else. Associates say Volcker does not suffer complex economic solutions, figuring anything that’s too complicated to understand is probably wrong. A fiscal as well as an inflation hawk, he’s also likely to have an eye out for unwanted short- and long-term effects of the proposals Obama considers for curing the nation’s economic ills. “I’m always looking for the dark cloud behind the silver lining,” Volcker told Charlie Rose in a March 18 interview, saying that policymakers should have seen the current crisis – and acted on it – much earlier. Volcker, observers say, is likely to advise Obama on stimulus policies as well as the less-immediate but still looming task of overhauling the supervisory regulatory structure of financial markets.